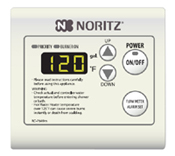 Click the button below to add the Noritz NRC98-DV-NG Natural Gas Condensing Tankless Water Heater to your wish list. The ENERGY STAR rated Noritz NRC98-DV-NG Natural Gas Condensing Tankless Water Heater, Noritz's brand new ultra-high efficient condensing model, demonstrates its ongoing commitment to the green movement by expanding its newest tankless water heater product line: the ecoTOUGH Series of high efficiency, easy-to-install, gas-fired condensing tankless water heaters. Max Vent Distance: 62' with 3" or 4" PVC or CPVC piping. This product was recommended for an in-floor radiant application and is currently installed and working flawlessly. It has a good warranty period and hope to have years of service. Also, qualifies for a rebate from my gas company. Does condense a lot of water.